ABSTRACT: The aim of this study is to date the rich plant deposit recently discovered in the hemipelagic terrigenous-carbonate succession of the Northern Dolomites (Italy), as well as to describe the rich Anisian palynomorph association observed in the studied section. For the palynological analyses the whole studied section was sampled and three different palynomorph assemblages are distinguished within the section. These assemblages were compared with various palynostratigraphic zonations proposed for the Southern Alps and the distribution of the main markers are discussed in relation to other coeval sections in Europe. Thus, the plant horizon can be positioned close to the middle – late Pelsonian boundary. One new genus and species, Braiessporites posenatoi gen. et sp. 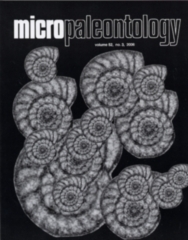 nov., are described and several other taxa are discussed for the first time in literature, such as Foveosporites sp. 1 and Convolutispora sp. 1. Several spores, including Striatella sp., are reported for the first time from Anisian sediments. Morphological variability of other taxa are discussed such as Jerseyiaspora punctispinosa, Uvaesporites gadensis and Converrucosisporites conferteornatus. The taxonomical position of Todisporites fungosus (Balme 1963) comb. nov. is discussed and a new combination is proposed.